Daughter of Pharaoh, whom Mered of the tribe of Judah married (I Chron. iv. 18). In the Midrash (Lev. R. § 1) she is called the foster-mother of Moses. Daughter of Pharaoh; identified in the Midrash with Moses' foster-mother. 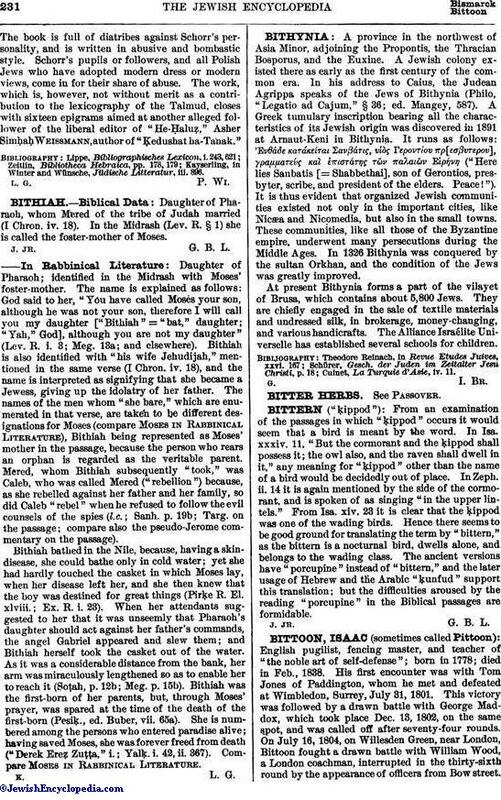 The name is explained as follows: God said to her, "You have called Moses your son, although he was not your son, therefore I will call you my daughter ["Bithiah" = "bat," daughter; "Yah," God], although you are not my daughter" (Lev. R. i. 3; Meg. 13a; and elsewhere). Bithiah is also identified with "his wife Jehudijah," mentioned in the same verse (I Chron. iv. 18), and the name is interpreted as signifying that she became a Jewess, giving up the idolatry of her father. The names of the men whom "she bare," which are enumerated in that verse, are taken to be different designations for Moses (compare Moses in Rabbinical Literature), Bithiah being represented as Moses' mother in the passage, because the person who rears an orphan is regarded as the veritable parent. Mered, whom Bithiah subsequently "took," was Caleb, who was called Mered ("rebellion") because, as she rebelled against her father and her family, so did Caleb "rebel" when he refused to follow the evil counsels of the spies (l.c. ; Sanh. p. 19b; Targ. on the passage; compare also the pseudo-Jerome commentary on the passage). Bithiah bathed in the Nile, because, having a skin-disease, she could bathe only in cold water; yet she had hardly touched the casket in which Moses lay, when her disease left her, and she then knew that the boy was destined for great things (Pirḳe R. El. xlviii. ; Ex. R. i. 23). When her attendants suggested to her that it was unseemly that Pharaoh's daughter should act against her father's commands, the angel Gabriel appeared and slew them; and Bithiah herself took the casket out of the water. As it was a considerable distance from the bank, her arm was miraculously lengthened so as to enable her to reach it (Soṭah, p. 12b; Meg. p. 15b). Bithiah was the first-born of her parents, but, through Moses' prayer, was spared at the time of the death of the first-born (Pesiḳ., ed. Buber, vii. 65a). She is numbered among the persons who entered paradise alive; having saved Moses, she was forever freed from death ("Derek Ereẓ Zuṭṭa," i.; Yalḳ. i. 42, ii. 367). Compare Moses in Rabbinical Literature.